WD's My Cloud EX4100 is a downmarket Marvell-based version of the top-of-line Intel Atom based My Cloud DL4100 reviewed a few months ago. There's also the two-bay EX2100 we won't be reviewing, if you prefer your NASes in RAID 1 form with a slightly slower processor and half the memory. WD sent a 16 TB WDBWZE0160KBK model as our review sample. 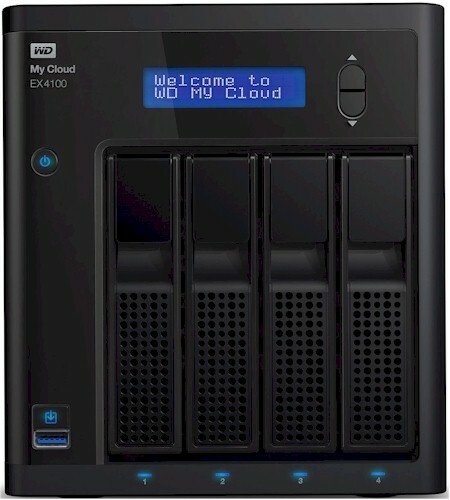 But the EX4100 also comes in diskless (WDBWZE0000NBK), 8 TB (WDBWZE0080KBK) and 24 TB (WDBWZE0240KBK) models. As we did with the DL4100, we're showing the 0 TB BYOD model for pricing, so you can more easily compare to other BYOD NASes. WD uses the "Red" series of NAS-optimized hard drives for all diskful My Cloud SKUs. The EX4100 and DL4100 share the case design shown in the callout graphics below, pulled from the DL4100 review. The only difference is the EX4100 has all USB 3.0 ports vs. the DL4100's two USB 3.0 and one USB 2.0. You can get complete charts for LED status (front and rear panel) from the User Manual here. The EX4100 also uses tool-less, tray-less drive bays. Table 1 shows the key components for the My Cloud EX4100, DL4100 and EX4. The dual-core Armada 388 is a big step up from the single-core Kirkwood and it shows in the performance results. The photo below shows the EX4100's board. The processor heatsink is kind of interesting. It's a hollow aluminum cube with a thermal pad taped on top for a little extra thermal mass. The DL4100's board is shown below for comparison. What you can't see is the single SODIMM slot on the other side of the board that supports DDR3 RAM expansion up to 6 GB total. The EX series RAM is all on board and there's no expansion slot. The EX models also dispense with the buzzer, so no audio alerts. They keep the LCD front panel display, though. Fan and drive noise was rated low. Power consumption for the external "brick" power supply was measured at 29 W (active) and 12 W (power save) with the four factory installed 4 TB WD Red (WD40EFRX) drives. All My Cloud share a common OS, so have the same features. The only difference is supported RAID modes, which depend on the number of drive bays. I won't repeat the feature rundown provided in the DL4100 review.